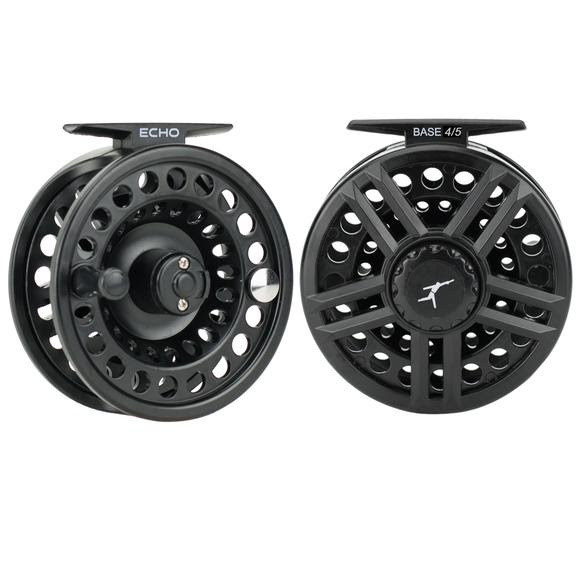 Echo's Base 4/5 fly reel features a durable, impact-resistant composite frame equipped with a bomb-proof drag system and stainless inner components. Perfect for beginning anglers and dyed-in-the-wool fisherfolk just the same. At a price like this, you can't go wrong with the Base reel! Echo &apos;s Base 4/5 fly reel features a durable, impact-resistant composite frame equipped with a bomb-proof drag system and stainless inner components. Perfect for beginning anglers and dyed-in-the-wool fisherfolk just the same. At a price like this, you can&apos;t go wrong with the Base reel!